Antibiotic resistance is a growing medical crisis, as disease-causing bacteria have developed properties that evade or overcome the toxic effects of many available drugs. More of these microbes are resistant to multiple medications, limiting physicians' options to combat patients' infections. As a result, a range of conditions – including pneumonia, bloodstream infections and gonorrhea – have become more dangerous and more expensive to treat, increasing healthcare costs by up to $20 billion annually. As researchers seek new antibiotics, they must overcome the mechanisms these microbes have evolved to survive. Most of today's medications don't work well against Gram-negative bacteria, which are difficult to penetrate because they are surrounded by two membranes with a cell wall sandwiched in between. (Gram-positive bacteria lack the outer membrane.) Gram-negative bacteria also deploy other defense systems: they assemble an assortment of membrane proteins into elaborate defensive structures known as efflux pumps that allow the cells to expel microbe-killing drugs before they work. Knocking out efflux pumps is a promising strategy both to create new drugs and bring old antibiotics back to life, says physicist James C. Gumbart of the Georgia Institute of Technology. But to target and neutralize these structures, researchers first must understand exactly how they function. That's where simulations can help. Over the long term, Gumbart would like to model the molecular dynamics – how molecules in efflux pumps interact – with the goal of rendering these defenses harmless. As one step in that process, Gumbart and his colleagues have zeroed in on a critical component of efflux pumps: the adaptor protein AcrA, which links the efflux pump components on the inner membrane with those on the outer membrane. "We know from various structural data that AcrA is a key component of the pump, bridging the gap between AcrB and TolC," two other vital membrane proteins. "Whether it has any role beyond a structural one, we don't know for sure," Gumbart says. To better study this protein, Gumbart and his team have used Titan, the Cray XK7 supercomputer at the Oak Ridge Leadership Computing Facility, a Department of Energy (DOE) user facility, to simulate the shape and related stability of AcrA as it interacts with other efflux pump components. An allocation of 38 million processor hours from DOE's Innovative and Novel Computational Impact on Theory and Experiment (INCITE) program supports their work. The research also relies on NAMD, a molecular dynamics code developed by the National Institutes of Health Center for Macromolecular Modeling and Bioinformatics at the University of Illinois, Urbana-Champaign, to simulate large biomolecular systems like this one in parallel on large numbers of computer processor cores. 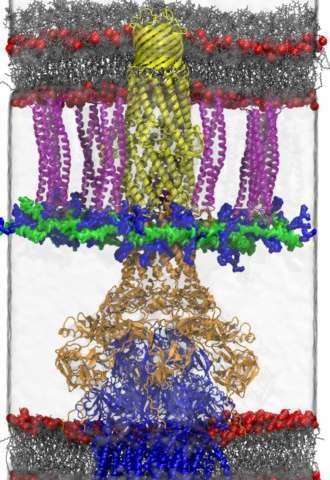 To construct their simulations, the team took advantage of a newly developed model of both membranes and the cell wall of the Gram-negative bacterium E. coli in atomistic detail. "To understand the assembly process, we must consider the environment in which it happens, namely the periplasm, which is the space between membranes," Gumbart says. "The periplasm includes a number of proteins as well as the cell wall, a thin mesh that gives bacteria shape and stability in a variety of environments." The researchers placed AcrA within an efflux pump structure that included partner proteins AcrB, from the inner envelope, and TolC, from the outer envelope. These petascale simulations, running at one quadrillion mathematical calculations per second, create parallel versions of the motions and energies of these bacterial proteins and membranes. The individual simulations include proteins whose conformations – ways that the molecules can easily twist and reshape themselves – differ subtly. To optimize their results, the researchers can occasionally swap energetically favorable conformations between simulations, a technique called replica exchange. Using this strategy, the scientists can map the free energy of the system. The lowest-energy combinations of AcrA, AcrB and TolC reveal scenarios and protein arrangements that are most likely to occur within a bacterial cell. For example, it isn't currently clear if AcrA adapts its shape before or after it initially interacts with AcrB, Gumbart says. "Our free-energy maps should help us to distinguish between these possibilities." The team also is analyzing its data to seek energy maps that show AcrA conformations that interfere with pump assembly. "If we can stabilize these conformations, we can hopefully inhibit multidrug efflux," Gumbart says. That information can guide the design of new, precisely targeted drug candidates called efflux pump inhibitors (EPIs). "The EPIs, in turn, will prevent the pump assembly or else block its function post-assembly." Such simulations also can test the effects of EPIs that Gumbart's collaborators already have designed, providing valuable information about which drug candidates might prove most effective and should be studied further. If successful, this strategy could revive some antibiotics that are no longer in use, Gumbart says, because researchers expect that combining them with an EPI could restore their potency. Gumbart and his team gathered a trove of data in just one year. "It would have taken at least four to five years to obtain using common supercomputing resources," he says. Team members include Jerry Parks of Oak Ridge National Laboratory; Jerome Baudry of the University of Alabama, Huntsville; Helen Zgurskaya of the University of Oklahoma; University of Tennessee, Knoxville graduate student Adam Green; and Georgia Tech graduate student Anthony Hazel. A better understanding of efflux pump assembly and strategies for altering or blocking these structures could be useful for treating other diseases, too. For example, a different type of pump causes drug resistance in cancer cells, Gumbart says. "In fact, efflux systems are found in all domains in life." Since completing the simulations this spring, Gumbart and his colleagues have been analyzing the resulting data to quantify the free energies, find patterns in the favored vs. disfavored conformations, and even determine why only some mutations affect pump assembly. More simulations will be needed to address related questions, but the current data still hold a number of secrets. Gumbart and his team will keep digging.